Introduction: Medullary breast carcinoma (MBC) is one of the rare variants of breast carcinoma, accounting for less than 5% of invasive breast carcinoma. MBCs relatively appear a decade earlier when compared to invasive ductal carcinoma (IDC NOS), which is more prevalent in the elderly age. Subjects and Methods: A retrospective study was conducted in the Department of Pathology from 2009 to 2016. Fine needle aspiration cytology slides of MBCs and IDCs were retrieved, studied microscopically, and reviewed to compare the cytological features. Results: During the study period, MBC cases were 12 and IDC were 319. Random 12 cases of IDC NOS were taken up for comparative cytological evaluation. Various cytological features are assessed and compared using chi square test and independent t test ratio. On comparison of IDC NOS and MBC cases in relation to the parameters like: syncytial clusters and nature of inflammatory infiltrate; the number of positive category was higher in MBC group (83.3%). In contrast, parameters like three-dimensional clusters, acinar pattern, and necrosis; the number of positive category was higher in IDC NOS group with a percentage of 91.7%, 100%, and 67%, respectively. Ratio of lymphoplasmacytic cells to tumor cells between the two showed that the ratio was higher in MBC group. This comparison was statistically significant with a P value of <0.001. Conclusion: Though few variants of breast carcinoma contain lymphoplasmacytic infiltrate, the intensity and pattern of distribution of these lymphocytes and plasma cells in relation to tumor cells helps in distinguishing MBC from other breast carcinomas commonly IDC NOS on cytology. Also MBCs have a better prognosis when compared to IDC NOS. Medullary breast carcinoma (MBC) is one of the rare variants of breast carcinoma with good prognosis. They account for less than 5% of invasive breast carcinoma., Clinical presentation is solitary well-circumscribed firm lump in the breast. Clinically, radiologically and on gross examination, they are often misdiagnosed as a fibroadenoma. This emphasizes the need for microscopic diagnosis. The most common age group is between 47 and 52 years. MBCs relatively appear a decade earlier when compared to invasive ductal carcinoma (IDC NOS) that is more prevalent in the elderly age group. Constellation of five histological features as described by Ridolfi et al. characterizes MBC, one among which is moderate to severe lymphoplasmacytic cellular infiltrate. MBCs on immunohistochemistry (IHC) often displays triple negativity (ER, PR, Her2/neu) with grade 3 Nottinghams criteria and exhibits basal phenotype. Cytology of MBC exhibits cellular smears with malignant cells arranged in syncytial groups and also as many large isolated cells. In addition lymphocytic and plasma cell infiltrate are conspicuously seen in the background., Cytology of IDC NOS differs from MBC wherein the IDC NOS tumor cells are arranged in discohesive three dimensional arrangement, acinar pattern and exhibit tumor diathesis with necrosis in the background. However, the finding of lymphoplasmacytic infiltrate is minimal in IDC NOS and other breast carcinomas when compared to MBC. Marginean et al. stated strong association of marked inflammation with better prognosis in triple negative carcinomas. Presence of lymphocytes and plasma cells enables to keep in check MBC, thus prevents growth and spread quickly. This necessitates the need for microscopic diagnosis to differentiate MBC from other breast carcinomas as a preliminary cytological diagnosis. Also axillary lymph node metastasis is 29–56% in IDC NOS, on the contrary less number of lymph nodes are affected (19–46%) in MBC., The 10-year survival rates of MBC and IDC is 84% and 63%, respectively. With this background, the study was performed to evaluate the cytological features that aid to differentiate MBC from IDC NOS and to analyze the ratio of lymphoplasmacytic cells to tumor cells in both. A retrospective study was conducted in the Department of Pathology. All the histopathology and IHC diagnosed cases of breast carcinoma during 2009–2016 were taken up for the study. 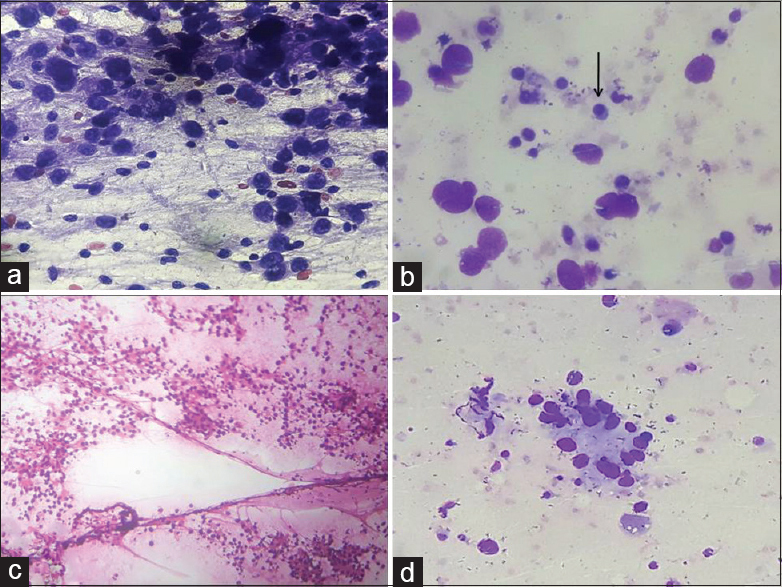 Fine needle aspiration cytology (FNAC) slides (Leishman and H and E stained) of MBCs were retrieved, studied microscopically, and reevaluated. We also studied randomly selected 12 cases of IDCs to compare the cytology with that of MBC. Cytological features evaluated in MBC and IDC cases were cellularity, cohesiveness, pleomorphism, syncytial aggregates, presence or absence of acinar pattern, and the ratio of lymphoplasmacytic cells to tumor cells. The number of lymphoplasmacytic cells and tumor cells were counted under high power (40×) field in the cellular areas. The ratio of lymphoplasmacytic cells to tumor cells were calculated in both. Data were analyzed using the chi square and P value was obtained. The ratio was analyzed using independent t test. During the study period, a total number of histopathologically and IHC diagnosed cases of invasive breast carcinoma cases were 388. Among these, MBC cases were 12 with the age range of 35–64 years. Six of 12 MBC cases (50%) were seen in the age group of 40–49 years. During the same period, IDC NOS were 319 occurring in the age group of 22–75 years. Majority of IDC NOS cases (50%) were seen in the age group of 50–59 years. Random 12 cases of IDC NOS were taken up for comparative cytological evaluation. The majority of the MBC patients presented as a solitary lump in the breast. Clinically, 9 of 12 cases were diagnosed as a fibroadenoma. All cases underwent FNAC. Needling of MBC lesions were soft in consistency as noted from the files and records. Skin changes like peau d'orange and puckering was not a feature observed in MBC, however, one patient presented with ulceration of the skin. The most common sites of MBC were upper inner quadrant and constituted about 50% of the cases. IDC NOS most commonly affected the upper outer quadrant. A cytological study of both MBC and IDC NOS smears were cellular. MBC cases displayed singly scattered malignant cells along with tumor cells in syncytial clusters of 4–5 cells thick. syncytial clusters were seen in 10 of 12 cases (83.3%). Individual cells exhibited increased nuclear cytoplasmic ratio, irregular nuclei, and prominent nucleoli [Figure 1]. Acinar pattern was noted in 2 of 12 cases (16.7%) and necrosis was not a feature of MBC in our study. The IDC NOS cases showed chiefly three-dimensional clusters of malignant tumor cells in 11 of 12 cases (91.6%) [Figure 2]. Also seen were tumor cells in the acinar pattern in all the 12 cases (100%) along with single malignant cells with intact cytoplasm. Syncytial clusters were absent. Tumor diathesis was noted in 8 of 12 cases (66.7%) [Table 1]. Chi square test was applied and P value was obtained statistically for the various cytological features assessed. In comparison of IDC NOS and MBC groups in relation to the syncytial clusters, the number of positive category was higher in MBC group (83.3%) with a statistically significant P value of <0.001. In contrast to parameters like three-dimensional clusters, acinar pattern, and necrosis, the number of positive category was higher in IDC group with a percentage of 91.7%, 100%, and 67%, respectively. This comparison was statistically significant with a P value of <0.001 [Table 2]. The ratio of lymphoplasmacytic cells to tumor cells were assessed in both cases. The lymphocyte is recognized by single round nucleus, condensed chromatin, and scant amount of granular cytoplasm. Plasma cells had round to oval eccentric-located nucleus with basophilic cytoplasm and a perinuclear Hoff. The morphology of lymphocytes and plasma cells were better assessed in Leishman stain in comparison to H and E stain. The ratio of lymphoplasmacytic cells to tumor cells in MBC and IDC NOS was 1.1–2.1:1 and 0.01–0.09:1, respectively [Table 1]. Comparison of the lymphoplasmacytic cells to tumor cells between MBC and IDC cases showed that the ratio was higher in the MBC group with a t value of −20.245 and was statistically significant with a P value of <0.001 [Table 3]. MBC was first described by Moore and Foote in 1949. They account for <5% of invasive breast carcinoma. Prevalence of MBC in our study is 3.1%, which is in concordance with the various studies available in the literature., Most common age group was 40–49 years and our observation are similar to a study conducted by Ridolfi et al. Santosh et al. has emphasized the consideration of MBC in the differential diagnosis of fibroadenoma clinically and grossly. Hence, we should keep in mind this type of carcinoma in the differential diagnosis of fibroadenoma., In our study nine cases were diagnosed clinically and radiologically as a fibroadenoma. On clinical examination, the lump was soft on palpation and similar consistency was noted on FNAC needling. Hence, these tumors are termed encephaloid and the term medulla in Latin means marrow. The aspirate was frequently opaque, spreads evenly like a lymphomatous aspirate of a lymph node. On cytological evaluation, we also observed that two cases of MBCs displayed few three-dimensional clusters and occasional acinar pattern (16.6%), which on histopathological examination turned out to be atypical MBC. Atypical MBC is defined histologically by not more than two of the following four atypical features such as margins with focal or prominent infiltrative pattern, mononuclear infiltrate mild or at the tumor margins only, benign appearing nuclei and the presence of microglandular features. Koss et al. stated that the presence of lymphocytes is mandatory for recognition of MBC. Kleer et al. in their study found numerous lymphocytes and plasma cells in both IDC NOS and MBCs. Due to overlapping features, they did not consider background lymphoplasmacytic infiltrate to be one of the differentiating features of MBC from IDC. But in the present study, we observed a good number of lymphocytes and plasma cells in MBC. In other breast carcinomas commonly IDC NOS, comparatively few lymphocytes were seen in relation to tumor cells. Presence of plasma cells was not a feature of IDC NOS in our study. The mean lymphoplasmacytic cells to the tumor cell ratio in MBC and IDC NOS were 1.9:1 and 0.04:1, respectively. Tumor giant cells are sometimes seen in MBC, but our study did not show any giant cells. 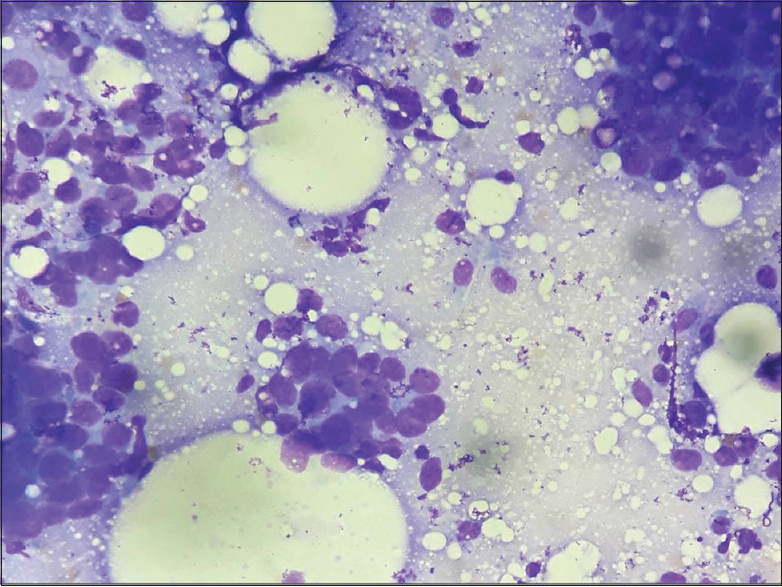 Other cytological differential diagnosis of MBCs includes chronic mastitis, intramammary lymph node, and lymphoma. Intramammary lymph node and chronic mastitis lack the large atypical tumor cells. The tumor cells of medullary carcinomas display syncytial aggregates that is an unusual finding in lymphoma. Histologically, 10 of 12 cases (83.3%) were diagnosed as typical MBC and two cases were atypical MBC (16.7%). IHC showed triple negativity in 75% cases of MBC comprising 80% in typical and 50% in atypical MBC. IDC NOS on histology showed tumor cells arranged in tubules, sheets, cords, and singles with desmoplastic stroma. IHC showed ER positivity in 62%, PR in 58%, and Her2 neu in 41% of cases. To conclude, though few variants of breast carcinoma contain lymphoplasmacytic infiltrate, the intensity and pattern of distribution of these lymphocytes and plasma cells in relation to tumor cells help in distinguishing MBC from other breast carcinomas commonly IDC NOS on cytology. In addition, cytological features of individual tumor cells add to the diagnosis. Differentiating MBC from IDC NOS at the preliminary cytological level is necessary as MBCs have a better prognosis compared to those of IDC NOS. Jagtap VS, Beniwal A, Shah HP, Bhosale SJ, Chougale PG, Jagtap SS. Medullary carcinoma of breast: Clinicopathological study. J Evid Based Med Health 2016;3:2256-60. Chu Z, Lin H, Liang X, Huang R, Zhan Q, Jiang J, et al. Clinicopathological characteristics of typical medullary breast carcinoma: A retrospective study of 117 cases. PLoS One 2014;9:E111493. Tavasolli FA, Devilee P. World health organization classification of tumors, Pathology and genetics of tumors of breast and female genital organs. Lyon: IARC press; 2003. Saad RS, Silverman JF. Breast. In: Bibbo M, editor. Comprehensive Cytopathology. 2nd ed. Elsiever; 1997. p. 713-72. Gattuso P, Reddy V, David O, Spitz D, Haber M. Infiltrating carcinoma: Pathological types. In: Guttaso P, editor. Differential Diagnosis in Surgical Pathology. 2nd ed.US Saunders, Elsevier ; 2010. p. 170-214. Howat A, Coghill S. Malignant breast tumors. In: Winifred G, editor. Diagnostic cytopathology, 3rd ed. US Elsevier US;Churchill Livingstone; 2010. p. 279-302. Marginean F, Rakha AE, Ho BC, Ellis IO, Lee AH. Histological features of medullary carcinoma and prognosis in triple negative basal like carcinomas of the breast. Modern Pathol 2010;23:1357-63. Kuroda H, Tamaru J, Sakamoto G, Ohnisi K, Itoyama S. Immunophenotype of lymphocytic infiltration in medullary carcinoma of the breast. Virchows Arch 2005;446:10-4. Ridolfi RL, Rosen PP, Port A, Kinne D, Mike V. Medullary carcinoma of the breast: A clinicopathological study with 10 year follow-up. Cancer 1977;40:1365-85. Santosh T, Bal AK, Patro MK, Choudhury A. Medullary Breast Carcinoma: A Case Report and Review of Literature. J Cancer Sci Ther 2015;7:142-4. Rosai J. Breast. In: Rosai J, editor. Rosai and Ackermans surgical pathology, 10th ed. Edinburg: Elsiever; 2011. p. 1786-860. Moore OS, Foote FW. The relatively favourable prognosis of medullary carcinoma of the breast. Cancer 1949;2:635-64. Cho N, Oh KK, Lee SI. Medullary Carcinoma of the Breast: Sonographic Features distinguishing it from Fibroadenoma. JMed Ultrasound 2002;10:191-6. Chetty R. Gastrointestinal cancers accompanied by a dense lymphoid component: An overview with special reference to gastric and colonic medullary and lymphoepithelioma-like carcinomas. Clin Pathol 2012;65:1062-5. Lester CS. The breast. In: Fausto AK, editor. Pathological basis of disease, 7th ed. Philadelphia: Elsiever; 2005. p. 1120-54. Koss LG, Melamed MR. The breast. In: Koss LG, editor. Koss diagnostic cytology and its histologic basis, 5th ed. New York: Lippincott Williams and Wilkins; 2006. p. 1082-148. Kleer GC, Michael CW. Fine needle aspiration of breast carcinomas with prominent lymphocytic infiltrate. Diagn Cytopathol 2000;23:39-42. Ducatman BS, Wang H. Breast. In: Cibas SE, editor. Cytology diagnostic principals and clinical correlates, 4th ed. Canada: Elsevier; 2014. p. 221-54.